Regenepure’s Precision 5% Minoxidil Spray for men *hair loss treatment and hair regrowth is the most effective way to apply minoxidil on the market. Unlike other minoxidil foams and droppers, this minoxidil spray leaves you mess-free, with the minoxidil being delivered directly & precisely to the hair follicles to stimulate hair growth. Our FDA-approved 5% minoxidil topical treatment is available over the counter, making it convenient for those with busy schedules and who desire effective results. Regenepure Minoxidil Treatment is the highest concentration of minoxidil available over the counter, giving you the hair growth you want. Male pattern baldness occurs when the hair follicles on the scalp become clogged with the male waste testosterone, dihydrotestosterone, or also commonly referred to as DHT. Sensitivity to this hormone causes your hair follicles to shrink, which in turn, makes hair fall out. This also makes new growth much harder to happen, which is why it’s important to remove DHT with a Ketoconazole shampoo like Regenepure DR and follow up with the Regenepure Minoxidil Spray. Minoxidil is known to prolong the improvement of new hairs on the scalp while making them resilient and much thicker over time. Minoxidil has also been clinically proven to arouse *new growth and helping hair develop in parts where the hair follicles have become inactive due to the result of DHT on the scalp. In order for minoxidil to actually work, it’s necessary to have the minoxidil delivered directly to the hair follicles to stimulate new growth. This can only be done if the minoxidil is used properly. 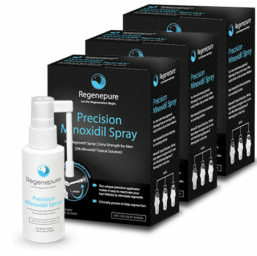 Regenepure Precision 5% Minoxidil Spray is superior because of the way in which it delivers the minoxidil to the scalp. The swivel head applicator allows for a mist that is evenly distributed across the crown of the head, quickly drying onto the skin. Foam and dropper forms of minoxidil are less effective than minoxidil spray because the foam usually sits directly on the hair, rather than get into the skin to deliver the results you want. The dropper almost always drips down the back of your neck before being absorbed by the hair follicles, defeating the purpose entirely. Due to the unnecessary waste from foams and droppers, you will never get an accurate interpretation of how much minoxidil was actually immersed onto the scalp. Regenepure Precision 5% Minoxidil Spray’s fine mist covers the entire area effectively and more widely. You will be able to target the hair follicles directly, ensuring more growth. You can always count on the Regenepure Precision Minoxidil Spray for a reliable, effective solution to battling hair loss and regrowing hair.